We adopted a roving oddball paradigm. The trains of repetitive tones of different frequencies were randomly presented. 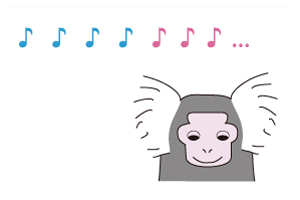 Epidural ECoG recordings were taken in the passive listening condition while monkeys were awake. Komatsu, M., Takaura, K., & Fujii, N. (2015). "Mismatch negativity in common marmosets: Whole-cortical recordings with multi-channel electrocorticograms." Scientific Reports, 5, 15006. Further information can be found on TychoWiki.